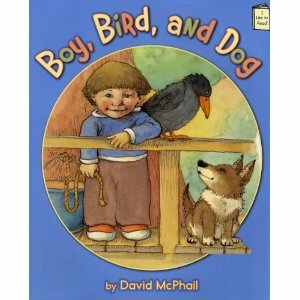 David McPhail is another author we discovered through the Virtual Book Club for Kids, and Boy, Bird and Dog was a huge hit in our house. I love this book for the reading/literacy stage that Wild Thing (just turned 3 in November) is at. He is doing well with identifying beginning letters of words (i.e. B is for Baby). He understands that letters create sounds and thus words, and he is getting interested in putting together those letters/sounds and identifying words. 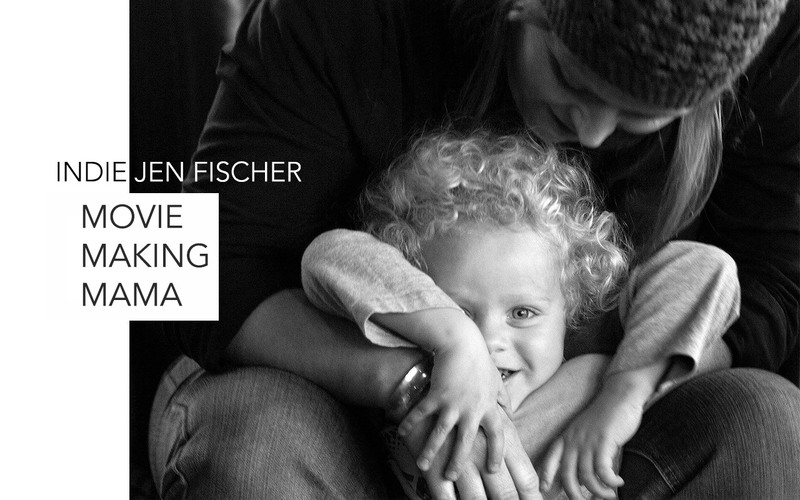 He has some words already under his belt: Go, Stop, Mom, Dad, as well as his name. 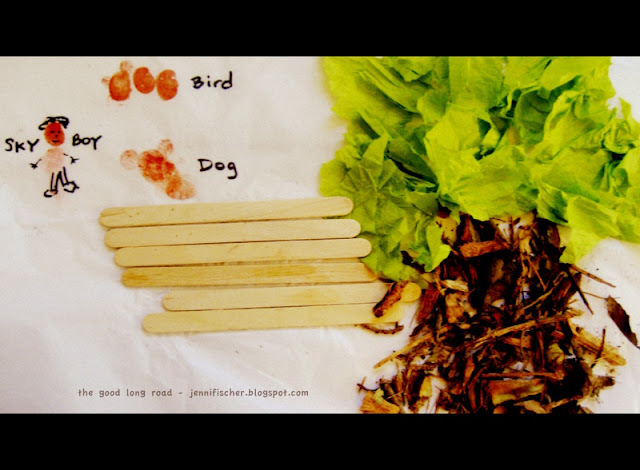 The simple words, writing style and structure in which Boy, Bird and Dog is written compliments exactly where he is at with the reading process and provided us with key sight words/new words to add to his I can read list: Boy, Bird, Dog (obviously) and Up. If you follow the blog, you know we always love to share the ways that we Move, Eat, Draw and Learn with our book club books, so here it goes. Move: This book naturally invites pretend play. After just one reading of it, Wild Thing wanted us to be the Boy, Bird and Dog and act out the book. Luckily, he has parents that are great sports and before I knew it, he and his dad were on the couch (The couch was the treehouse from the book, and they were the bird and boy). The fun continued from there. Ultimately, Caterpillar (almost 18 months old) ended up being the mom bringing cookies to the treehouse, which basically just meant he ran around the living room exclaiming - COOKIES! and giggling with glee. It was very fun impromptu pretend play indeed, and I wish there had been a way to capture an image of this magic, even though we were all completely wrapped in it. Given how much fun that impromptu experience was, I put together a Storytelling Bucket (rather than pot, which is what the boy uses in the story to raise his dog and then cookies up into the treehouse) for us to take to the park for a playdate we were having, and the boys got active climbing and pulling the rope as they reenacted the story at the playground! So fun. Eat: Somehow we keep selecting books that happen to have cookies in them. We ate and made cookies. I think I am going to start referring to our favorite cookie books as bookies! We have gotten fancy in the past with carrot cake cookies and such, but we kept it simple and made basic chocolate chip cookies this time. Draw: This book inspired two art activities. 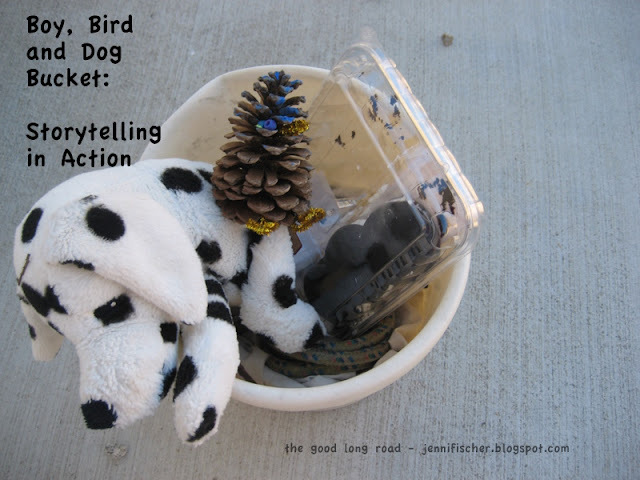 One functional activity that provided us with a bird for our storytelling bucket (see the pinecone bird above - that is a bird, in case you were not quite sure). The other art activity involved some treehouse creativity. 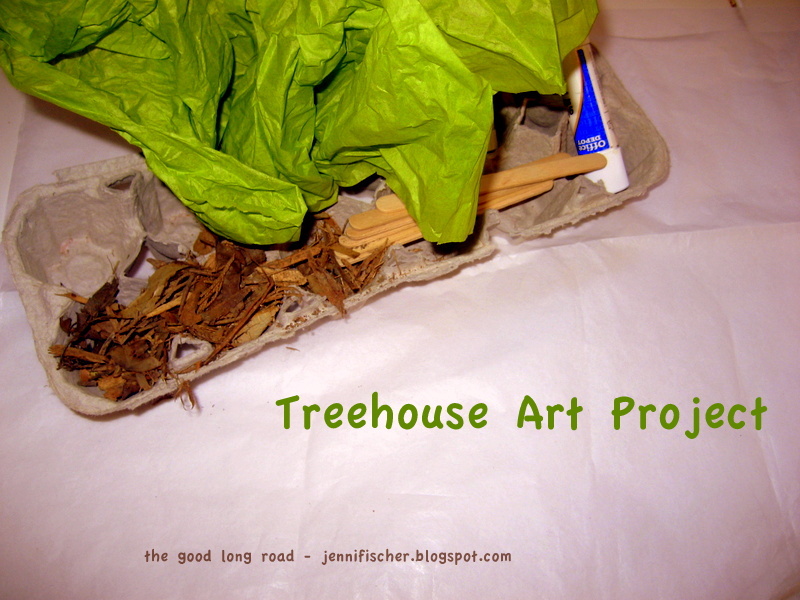 We do not have a tree in our yard that would work for a treehouse, and the treehouse in the book certainly captured the imagination of Wild Thing, so we did a multi-media treehouse art activity so that we could have a treehouse of our own at home. 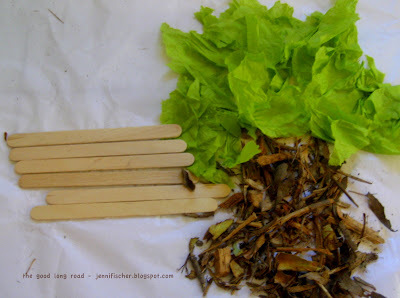 The supplies were quite simple and took advantage of what we happened to have on hand - tissue paper, wood chips and Popsicle sticks. Once the treehouse was done, Wild Thing really wanted to add the Boy, Bird and Dog, so I thought that fingerprint/thumbprints would work well for that. He also wanted me to write out the words and told me which letters to put for each word - sounding it out as we went (you will see below how we used this book for some great early literacy/reading activities). 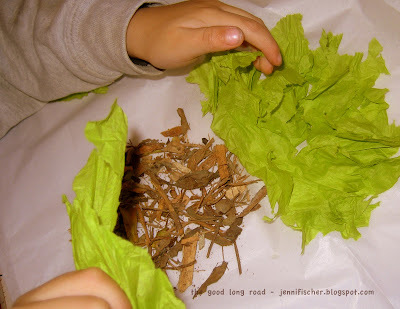 Learn: While the storytelling, pretend play and art activities certainly involve lots of learning, we also did two learning activities that were specifically focused on early reading. 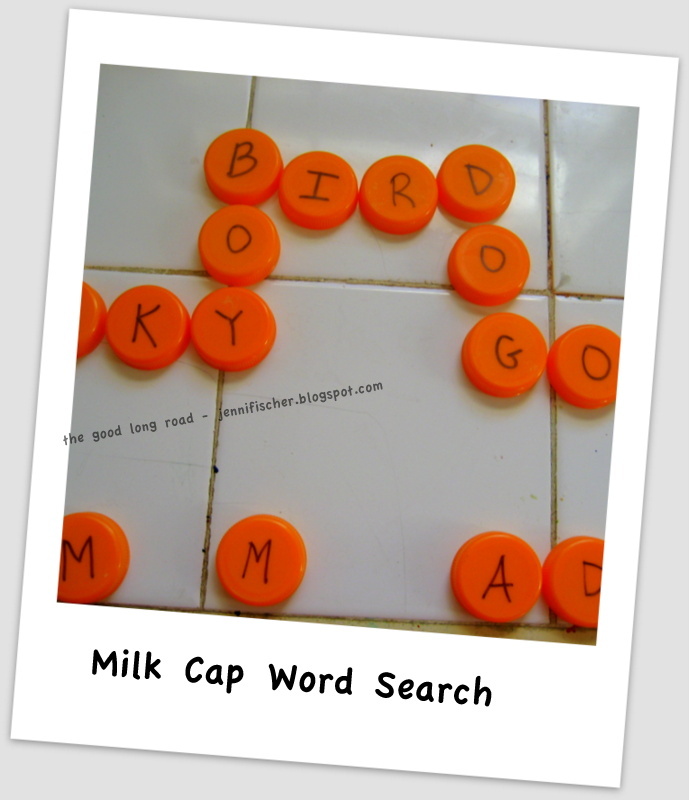 We created a simple Sight Word Jumping/Matching Game and a Milk Cap Word Search. With both, I focused on just a few key words from the book, as mentioned at the beginning of the post, so that Wild Thing could really focus on those words - recognizing them and understanding how those words are made (how the letter sounds come together to form the words). I put the words on the floor and had him jump to each word after I said it. We did this with just me saying the word and then I read through the book and he jumped from word to word as the word came up in the book. Bird and Boy caused some confusion at first, since they both start with the letter B, but that provided a great learning opportunity as we discussed how the letters in each word sound. I also put out Boy, Bird and Dog toys for him creating a matching game for the set up as well. 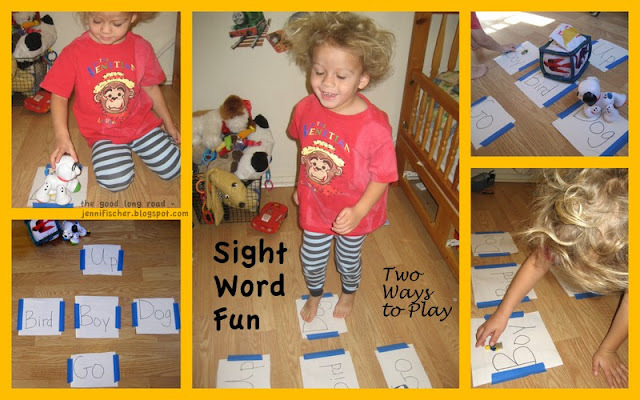 I like the Sight Word Jumping/Matching Game because it involves gross motor skills. 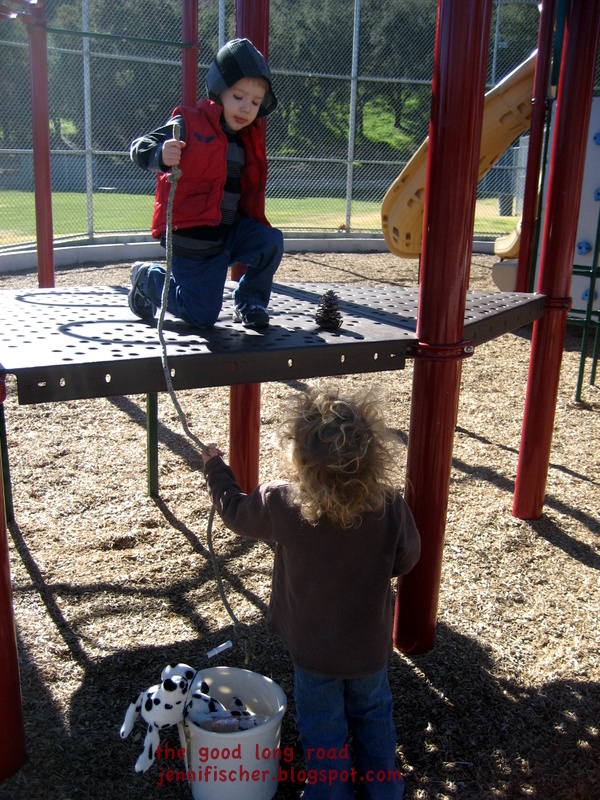 For active children, learning activities that let them move and that involve their whole bodies can be really helpful. Next time, I think I will use the Milk Cap Letters for literacy activities in the evening time when we focus on quiet activities, rather than mid-day. I also learned that spelling downward (rather than across) confuses Wild Thing, so I need to remember to keep it simple when we use the Milk Cap letters for early reading/spelling activities. A bonus thing that made this book perfect for our family is that it is also a great book for Caterpillar in terms of vocabulary-building (he is 18 months) and language development. He loves to look at the book and point at the various items and tell me their names. I think this book is going to be in heavy rotation from the library. What fun! I love your tree house craft and movement activities! I love your masterpiece, too! I need to look for this book - we haven't read it. Thank you for linking to Read.Explore.Learn. I will be sharing this post on the Read.Explore.Learn. Facebook page on Monday. I love all of the things you did with this book! Wow! Such a great bookie! I love the impromptu play it inspired and your tree house craft turned out amazing. We did a similar type of jumping game but with letter sounds - we will have to try it again with words. 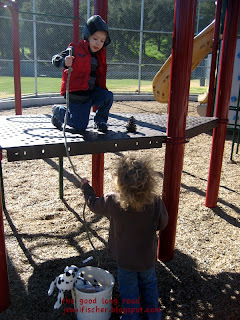 I love that you took the story bucket to the park to continue the fun there! We reenact stories from time to time but usually we just gather up props as we're doing it. I like the idea of having the props in one place, ready to play with. Going to have to try that! "bookies". I love that! My son is about the same, reading some sight words, using beginning letter sounds to "read" and monitor memorized text, so we have to check this out. Thanks for all the great ideas! I love the idea of doing the activity while reading the book. I've seen lots of ideas that are activities that coordinate with the book, after you've read it or know it well... but fewer that are meant to go along the the book. So I love the story in action bucket! 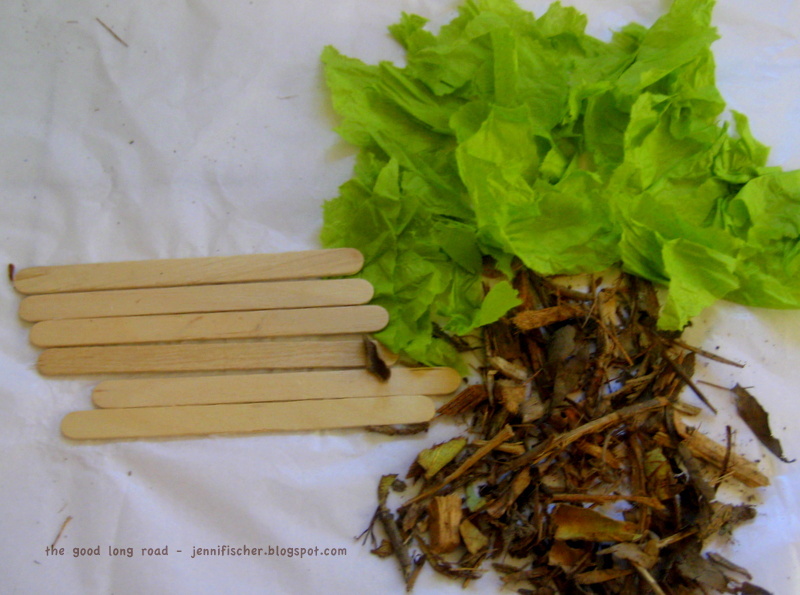 Thanks for stopping by our Play to Learn Blog Hop! We'll be hosting again the first Saturday in March, make sure to stop by! I think it's really nice activities to do with our kid, love it all, thank you.